More than just places to rest your head, these stellar spots are destinations unto themselves. A restored 18th century villa. A five-star hotel steep on the sea, having terraces overlooking the Gulf of Naples and a wonderful Vesuvius in the background: among the most renowned hotels in Sorrento, the Bellevue Syrene lies in a place of eternal, timeless beauty. This hotel has Anacapri's only Michelin-starred restaurant: l'Olivo. From its dominant position, the Capri Palace Hotel & Spa offers breathtaking views over the Bay of Naples and the island of Ischia. The stone floors, the arches, columns and vaulted ceilings recall the typical architecture of the Mediterranean palaces of the 18th century. The travertine baths, the warm tones of the fabrics and the sumptuous white and gold décor give each room an understated elegance that combines with the feeling of a deliciously warm welcome. Just outside of Sorrento, this building was originally a restaurant built by Don Giovanni Carace in the 1950's. La Minervetta sits on the seacliff overlooking an old fisherman's village, just minutes away from the centre of Sorrento. This hotel sits on 15 acres of parkland minute outside of Rome. Overlooking the panorama that has inspired visitors for centuries is Rome's most prestigious address. Though only minutes from the city's great monuments, the Rome Cavalieri has the tranquillity of an oasis. Enclosed in fifteen acres of lush Mediterranean parklands, it is a calm retreat in the heart of the Eternal City, an elegant refuge where time slows and hearts quicken. Near Lake Iseo and the Capo di Ponte national park. A charming 5-star resort in the verdant hills of Franciacorta a few minutes' drive from Lake Iseo, L'Albereta Relais & Chateaux is an enchanting place off the beaten track. The ideal get-away for those seeking the pleasure of "some time-out," L'Albereta seduces its guests with refined proposals for wellness and haute cuisine, with the Gualtiero Marchesi Restaurant and SPA Espace Vitalité Henri Chenot wellness & medical centre. Centrally located in Milan's historical Galleria Vittorio Emanuele II. The Town House Galleria hotel is located in the heart of the city of Milan. It is a unique and prestigious property, intimate and exclusive, assuring the highest level of service. Each room is catered to by a professional butler. Town House Galleria is a symbol of elegance and has the honour of being the only hotel to be located inside the historical "Galleria Vittorio Emanuele II" built in 1876. The architectural features of this historical land-mark, like the hand painted vaulted ceilings and large shuttered windows, have been preserved to provide guests with a unique environment. The tasteful blend between the contemporary and traditional style of the décor contribute to the unparalleled ambience provided. This stunning new hotel is a precious jewel in the crown of Italy's fashion city. Caters to travelers visiting Milan for its fairs and large-scale events. A small Boutique Hotel offering chic accommodation for sophisticated travellers, Town House 12 is located in central Milan, near Corso Sempione and the FieramilanoCity exposition centre. Boasting minimalist, modern design, the hotel provides a relaxing atmosphere, suitable to both business and leisure travellers. The philosophy of well-being is carried out throughout the hotel, where the colours that prevail reflect a state of peace. The 16 bedrooms have been tastefully furnished, with a great attention to all details, to satisfy guests needs and requirements. Some superior rooms have a private balcony or terrace. Converted 17th century convent on 11 acres surrounded by olive trees overlooking Lake Garda. In the enchanting environment of the Salò hills, with a magnificent view of Lake Garda stands the Hotel Villa Arcadio surrounded by olive trees, woods and flowers. The Hotel is an ancient restructured convent and its evocative ambience makes it an elite resort for discerning travelers to rediscover the atmosphere much loved by poets, artists and refined travelers. This is one of the most exclusive 4 star hotels in Salò. It is on the Brescia shore of Garda Lake, 36 kilometers from Brescia and it has a restaurant, a panoramic swimming pool, rooms with views and a wellness program. On Lake Maggiore in a park with views of the Borromean Islands and the Alps. Built in 1861and wisely renovated in 1991, its original structure is completely unaltered -- where the "Belle Epoque" seems never to fade. A neoclassical property overlooking Piazza della Repubblica. Dominating Piazza della Repubblica, luxury five-star Hotel Principe di Savoia is the home for international travellers and cosmopolitan society since the 1920's. Hotel Principe di Savoia offers a winning combination of Old World luxury, latest technology and design innovations. It is convienently located in the city center, near Milan's major attractions and the shopping district, 50 minutes away from Milan Malpensa airport. Torre Coccaro is a Masseria built not far from the sea whose origins date from the XVI century. Surrounded by antique olive trees, almond trees and carobs, this tower, once a stronghold against the Turks, has now become a five star resort whose aim is to bring back the guests to the antique natural life and make them benefit in full from the simple pleasures of rural life. The courtyard hosts an ancient chapel dating from 1730 where the people of Savelletri, a fishermen's village nearby, walked to worship the patron saints, before reaching the tufara, the quarry where the tuffs to build the farm were cut; this tufara has now become the vegetable garden of the farm; along an ancient pergola from which the resourceful irrigation technology can be observed. On the bank of river Anapo beside Fiume Ciane natural reserve, Caol Ishka Hotel pleasantly combines the traditional Sicilian masseria with a warm modern design. Only five minutes from the old town of Ortigia , a 4 star hotel with restaurant immersed in a beautiful garden with swimming pool. The love for vineyards and the sea, shared by generations of the Tasca d'Almerita family, has given life to the CAPOFARO Malvasia & Resort on the island of Salina. Located on the coast between the villages of Malfa and Santa Marina, it overlooks the lighthouse or faro from which it takes its name. Lush pockets of typical Mediterranean vegetation alternate with tall cliffs of dark volcanic rock that drop abruptly to the sea past vineyards and small white houses. The Gutkowski is a small hotel consisting of 25 rooms divided in two old buildings, in which originally lived fishermen and craftsmen, now restored in a contemporary style, respectful of the tradition. The hotel is located in Ortigia, the historical center, in Lungomare di Levante, and some of its peculiar qualities -- like the natural colors that surrounds the buildings, its intimate interior and friendly atmosphere -- make of this place the ideal accommodation for anyone who loves traveling. All the main historical sites of the centreare easy to reach walking. The breakfast is all based on natural earth products (agricoltura biologica): orange juice in winter, almond milk and frozen almond water-ice in summertime, homemade lemon and apple jam, fresh fruit, homemade cookies, cheese, brioches and croissant. In summer, it is possible to enjoy your breakfast on the terrace. You can reach this hotel, 1,500 feet above the town of South Tyrol, by cable car, for skiing & snowboarding in winter and hiking & mountain biking in summer. The wine cellar, with hundreds of Italian wines, is open for tours & wine tastings and the restaurant servers both Tyrolean and Italian food. 1.500 meters above everyday life. No traffic noise, no rushed business meetings, no arrivals nor departures by car. The luxury eco Design Hotel vigilius mountain resort in South Tyrol can be reached exclusively by cablecar. The air is laden with calm, tranquil thoughts, flavoured with the invigorating scent of the larch woods. Here it is possible to regain what you have been longing for; a clear view of oneself, a renewed vision of life. There is nothing obtrusive, nothing rigid. You alone define what to do. Waldhotel**** Tann is filled with tradition but at the same time with a touch of modernity and elegance in every detail. Everything we do is for your enjoyment. Taking this as our starting point, we aim to please you around the clock, helped by the warm, cosy timbers that breathe the scent of the forest all around, and the enchantment of the mountains that enters through the light airy windows and that never fails to fascinate us all. By the open fire or on the terrace with its panoramic views experience the "lightness of being" and soak up life with all your senses. Body and soul will be as one in the still, natural and secure surroundings, enveloped by unassuming luxury. An enchanted city sanctuary in the midst of Florence, where an art-filled Renaissance palazzo and conventino frame a centuries-old private park. Relax amidst original frescoes and sculptured reliefs, graced by sunlight and airy garden vistas. Sip cappuccino under majestic trees, lounge by the open-air pool or bask in Italian spa secrets. Wonders of the Uffizi and Duomo are a stroll away. Tuscan hill towns beckon. San Felice is a small hamlet dating back to the Middle Ages, which has maintained its typical rural Tuscan architecture intact. An enchanted spot, surrounded by the vineyards and olive groves that cover the rolling hills of the Sienese countryside. A pearl in the prestigious international chain Relais & Chateaux, Borgo San Felice offers its unique hospitality, a delightful refuge in the heart of Chianti country, just 15 km from Siena, an hour's drive from Florence and two and a half hours from Rome. Ah, the chef's life! The Poggio Rosso restaurant in now offering its guests a very special seat at the table: the kithen table that is! Chef Antonio Fallini himself will personally serve the meals to your table and might even reveal some of his best kept secrets in the kitchen. In the heart of downtown Florence, in Piazza Santa Maria Novella, just a few steps from the Renaissance church bearing the same name, one of these rare, extraordinary islands in the sea of life can be found. JK Place, an absolutely special hotel experience, is hidden away behind a charming door. An elegant habitat that joins atmosphere with scents from the past while at the same time offering precise and decidedly contemporary comfort, JK Place follows a philosophy of hospitality that is truly different, tracing a peculiar microcosm, far from overused clichés and evening routes. A real house, with fireplaces aglow, meaningful contemporary flavours and objects deposited over time, with its overlay of happy memories and a soft approach, refined, attentive but never invasive. Villa San Michele must be one of the most romantic places in the world. This former monastery, nestled on a hilltop surrounded by trees and terraced gardens, overlooks the city of Florence below. Dating from the 15th century its facade is attributed to Michelangelo. To step inside is to experience the ethereal beauty and solitude of a renaissance building that is as much a part of Italy's culture as the country's greatest cathedrals and galleries. Here, each visitor is a privileged guest, invited to stroll in the Italian gardens, filled with lemon trees and roses, and savour the superb Tuscan cuisine on the alfresco loggia as if in a private home. 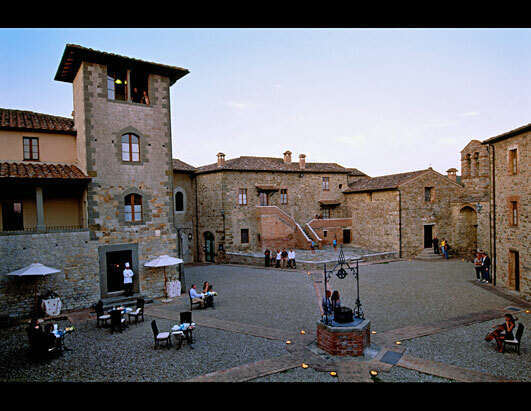 Built in an 11th century hill town in Tuscany and featuring a Gordon Ramsay restaurant. One of the most beautiful stretches of countryside in Italy lies among Chianti vines, corn fields, chestnut forests and long rows of cypress trees: this is the Tuscany of the Ombrone Valley -- a land blessed with masterpieces of painting and food and the greatest, unparalleled art of knowing how to live life. A small but intact medieval village called Monastero dell'Ombrone survives from the 11th century and is recorded in the archives of the era. Today, within these thousand-year-old walls which were once the home of the noble Chigi Saracini family of Siena, 76 guestrooms and suites and a villa of pure elegance radiates. Castel Monastero is a part of the Eleganzia Hotels & Resorts collection, a new exclusive Italian brand of luxury hotels. The aim of Eleganzia is to create a collection of unique high-profile hotels with a 'made in Italy' charm and style. In the village square, among the oldest and most earnest of medieval traditions, a highly sophisticated gourmet restaurant, opened in partnership with well-known chef Gordon Ramsay and run by a rising star of Italian cuisine, Alessandro Delfanti. Situated in Corrubbio, in the heart of the Valpolicella area and only 7 km from the centre of Verona, Byblos Art Hotel Villa Amistà offers a unique and evocative setting with all the characteristics of a classical Venetian-style Villa. The large building, featuring a 15th century facade by Michele Sanmicheli, had been abandoned for some time before being carefully renovated. The Hotel Cæsius complex stands in lush green surroundings just a short distance from the lake and offers its guests a truly relaxing atmosphere. Comfortable and elegant, the structure has a warm and bright atmosphere, typical of the Mediterranean. On the "Olive Riviera", the wonderful summer months follow an enchanting spring, before making way for a delightful autumn and the bright days of an extraordinarily mild winter. The cool blue waters, set amongst lush, green hills, reflect the bright sunshine. This is Lake Garda, with its crystal clear stretches of water, fresh air, sunny beaches, and easily accessible relaxing walks that wind their way through truly captivating scenery. It is a corner of paradise that is blessed with a mild climate. In Bardolino, olive trees mix with vines and the pure waters counterpoint of the acclaimed red wine produced on the nearby hills. The "Maccaroni" is a small 3-star hotel, 5 kilometers from the center of Padova and a few steps from the restaurant "Le Calandre". With 34 comfortable rooms it's the ideal place for businesspeople looking for tranquility and comfort, and also for the gourmet, who can relax after enjoying the gastronomic experience in the Alajmo world. The Renaissance of an architectural classic, reborn as Venice's newest landmark! The Molino Stucky Hilton Venice is the former home of the Molino Stucky Flour Mill, one of Venice's fundamental examples of industrial architecture built between the 19th- and 20th- centuries. It is recognized as one of the most beautiful flour mills in Italy and important to the personality and landscape of Venice. Large, generously lighted spaces and delightful nooks, haute cuisine, wellness, pampering, exclusive shopping and much relaxation at its best on the lush island that gave its name to Venice's San Clemente Palace Hotel & Resort. A refined luxury resort for elite tourism, in the central lagoon of Venice, with a spectacular view of the town, its lagoon and Giudecca Island. An exclusive 5 star luxury hotel with a unique location in Venice, the ideal destination for weekends and holidays for both couples and families, for celebrating weddings and private occasions, and holding meetings and international events. The Cas'almare is made up of restored fishermen's cottages along the sea on the island of Favignana off the west coast of Sicily. The historic port town of Favignana is only a 10-minute walk away. There you will find restaurants, bars, shops and markets. The private beach has its own restaurant and bar with a license to serve food and drinks on the beach 24 hours a day; there are mini wine cellars in every room; the rooftop bar serves sushi and tapas; the town has a food market on Wednesday and lots of shopping. Two golf courses, a mile long beach, a huge spa, five bars, four restaurants and each room has its own terrace facing the ocean. And, oh yeah, there is a huge infinity swimming-pool near the beach. There are also bicycles and golf carts for you to use to get around and kayaks you can use in the ocean. You enter the hotel through a 17th century chapel. Each room has a spectacular view and its own terrace. There is also a spa, a restaurant (Carlino), a bar and tennis courts.